I shall always remember the first time I was privileged to view the Last Judgment of Michelangelo in the Sistine Chapel at the Vatican. Having arrived at the Pontifical North American College in Rome to begin my last four years of study and formation before priesthood ordination, I could not wait to see so many great works of art, about which, up to that point, I had only read. Very soon after my arrival, I had the occasion to visit the Vatican Museums. A significant part of the visit is the Sistine Chapel. On the wall behind the altar of sacrifice is the Last Judgment, a wonderful fresco of the artist Michelangelo, which depicts the Final Coming of our Lord, at which the bodies of the just will be received into Heaven and the bodies of the impenitent will be consigned to Hell. In studying the fresco, I was struck by a figure of two of the just, whose bodies are being drawn into Heaven by the Rosary. This figure recalled to my mind what a powerful prayer the Rosary is in the Church and the many graces which I have received through the praying of the Rosary. On October 16, 2002, our Holy Father Pope John Paul II published his Apostolic Letter On the Most Holy Rosary (Rosarium Virginis Mariae). He did so to commend to us the praying of the Rosary in carrying out the New Evangelization, in studying and living the Catholic faith with new enthusiasm and new energy, with the enthusiasm and energy of the first disciples of our Lord. Our Holy Father reminds us that the Rosary, which was given to the Church early in the Second Christian Millennium, “is a prayer loved by countless Saints and encouraged by the Magisterium.” (No. 1) Obviously, the artist Michelangelo understood the great love of the Rosary in the Church and depicted the power of the prayer in his fresco, the Last Judgment. Our Holy Father considers the Rosary so important a part of the New Evangelization that he has declared October 2002 to October 2003 the Year of the Rosary. He describes his Apostolic Letter On the Most Holy Rosary as a complement to his Apostolic Letter At the Close of the Great Jubilee of the Year 2000 (Novo Millennio Ineunte), which is a most powerful reflection upon the New Evangelization in the life of the Church. In Novo Millennio Ineunte, the Holy Father reminds us that the New Evangelization can only be accomplished by Christ, and, if we are to be His agents, we must first know and love Him by contemplating His Face through prayer and worship. For our Holy Father, the Rosary “is nothing other than to contemplate with Mary the face of Christ.” (No. 3a) It is a privileged way of contemplation of the Face of Christ through prayer and worship, by which we are able to bring Christ into our lives and to the world, in order that He may transform us and the world. Through the Rosary, our Blessed Mother herself assists us to look upon the Face of Christ as she did from the moment of His Birth, throughout His public ministry, at His Passion and Death, and in His Resurrection and Ascension to the right hand of the Father. Pope John Paul II invites us to contemplate the Face of Christ through the praying of the Rosary. In order to underscore his invitation and also to honor the 120th anniversary of the Encyclical on the Rosary of Pope Leo XIII, Supremi Apostolatus Officio (September 1, 1883), the Holy Father has announced, through his Apostolic Letter, the Year of the Rosary (October 2002-October 2003), a time to emphasize and to promote the praying of the Rosary in homes and in the wider Christian community. It is my hope that families and parishes and other Catholic institutions will pray the Rosary with renewed faith during the Year of the Rosary, so that it may become a stable part of the prayer life of all Catholics. The effectiveness of the New Evangelization depends upon the praying of the Rosary, contemplating the face of Christ with Mary, His first and best disciple. Our Holy Father aptly points out that the Rosary, while Marian in character, “is at heart a Christocentric prayer.” (No. 1b) In other words, although the prayer consists of a repetition of the Hail Mary, it centers on the mystery of the Redemptive Incarnation, the mystery of the coming of God the Son in our human flesh in order to free us from sin and everlasting death. Pope Paul VI rightly called the Rosary a compendium of the Gospel, for the mysteries of the Rosary are the essential events of the work of our Redemption. With Mary, we reflect upon the events of the Redemptive Incarnation and, thereby, look upon the Face of Christ, as she did from the moment of His Birth to His appearance to her after His Resurrection. Looking upon the face of Christ, we hear His invitation to unite our hearts to His Sacred Heart, to unite our lives to His, and, with Mary, we give our fiat to our vocation and mission in Christ, which is daily conversion of life and the transformation of our world into a civilization of love. Prayer is our way to look upon the Face of Christ. Therefore, if we are to carry out effectively the New Evangelization, to bring Christ fully to our world, we must contemplate intently His Face by leading a “Christian life distinguished above all in the art of prayer.” (No. 5a) The Holy Father notes the strong interest in spirituality among many in our secularized society and the influence of other religions, especially eastern religions through their forms of meditation. In order that those who hunger for the spiritual life truly find it in Christ, it is necessary for our families and parishes and other Christian communities to be centered in prayer, centered in Christ whose Face we contemplate in prayer. “The Rosary belongs among the finest and most praiseworthy traditions of Christian contemplation.” (Ibid., No. 5b) In Christianity in the West, the Rosary developed as a strongly meditative prayer, bringing us always back to Christ and to a deeper appreciation of the great mysteries of the Incarnation and Redemption. You may have heard of a similar form of meditative prayer, the Jesus Prayer, which is practiced in Eastern Christianity. Repeating over and over the words, “Lord Jesus, Son of God, have mercy on me, a sinner,” the faithful come to a fuller knowledge and love of Christ and of His redemptive work in their lives. The Rosary has proven to be most effective in leading Christians of the West into ever deeper prayer and mediation. In commending to us the Rosary as a daily prayer, the Holy Father also asks us to pray for two special intentions: peace and the family. The Holy Father reminds us that the new millennium began with the unspeakable terrorist attacks of September 11, 2001, and that terrorism, civil strife and warfare are found throughout the world. The Rosary is our means of looking upon Christ Who alone brings us peace. During the last millennium, the Roman Pontiffs frequently urged the faithful to pray the Rosary for peace. Through the Rosary, peace will be attained in our personal lives and in the world. Recall the tremendous power of the Rosary to spare God’s people at the Battle of Lepanto. For us as individuals, the contemplation of Christ leads naturally to the desire of reconciliation and peace. Christ, by His saving Passion and Death has broken down all walls which divide us, the walls erected by sin. Going, with Mary, to Christ, we find His peace and are enabled to bring His peace to others. The Holy Father asks us to pray the Rosary especially for peace in the Holy Land, the land made sacred by Christ. (Ibid., No. 6a) In the present time, we must pray especially for peace in Iraq, the ancient Ur of the Chaldees where Abraham first encountered God. Christ, as He was dying on the cross, entrusted the Church into His Mother’s care and entrusted His Mother into the hands of the Church, represented by Saint John the Apostle and Evangelist. The Blessed Mother exercises her maternal care in a most effective way through the daily praying of the Rosary. How often the Mother of God has made known her desire that we should pray the Rosary for the salvation of the world. Our Holy Father calls to mind, in particular, the apparitions of the Blessed Mother at Lourdes in 1854 and at Fátima in 1917. Lourdes and Fátima remain places of strong devotion to which pilgrims travel from all over the world. At these shrines, pilgrims learn in a special way the importance of praying the Rosary for holiness of life and the conversion of the world. I vividly recall my experience as a seminarian during the summer after my first year of theological studies. A classmate from Milwaukee and I made pilgrimage to Lourdes during the month of August. I was struck by the large crowds of faithful who had come to the Shrine of Our Lady of Lourdes, seeking solace and hope. On the first evening of our visit, there was the praying of the Rosary and the procession with the blessing of the pilgrims with the Most Blessed Sacrament exposed in the monstrance. As the Blessed Sacrament was coming near to where my classmate and I were standing someone behind me kept pushing forward. Somewhat annoyed, I turned around to discover a young mother holding aloft her child, affected by Downs Syndrome, to be blessed by our Lord in the Holy Eucharist. I will never forget the radiantly strong faith reflected on her face. Pope John Paul II concludes the Introduction to his Apostolic Letter by mentioning briefly the saints for whom the Rosary was an altogether special means of growing in holiness of life. He mentions, in particular, Saint Louis Marie Grignion de Montfort who wrote The Secret of the Rosary. The writings of Saint Louis de Montfort have exercised a particularly strong influence on the Holy Father, who took his motto from the words of the consecration proposed by Saint Louis: Totus Tuus (Completely Yours). He mentions, too, Saint Pio of Pietrelcina, who had such a strong devotion to our Blessed Mother and to the praying of the Rosary. Saint Pio is very close to us in time, only having died on September 23, 1968. Just two days before his death, Saint Pio gave again what was his regular instruction: “Love Our Lady and make her loved. Recite the Rosary and recite it always and as much as you can” (Franciscan Friars of the Immaculate, Padre Pio: The Wonder Worker, 1999, p. 89). Pope John Paul II canonized Padre Pio a saint on June 16, 2002. Our Holy Father also mentions Blessed Bartolo Longo who had the Church of Our Lady of the Holy Rosary built in Pompei, and who “promoted the Christocentric and contemplative heart of the Rosary,” with the strong support of Pope Leo XIII (cf. Rosarium Virginis Mariae, No. 8). The example of the saints should convince us of the power for growth in holiness of life found in the daily praying of the Rosary. If you are not already doing so, I urge you to take up the practice of looking daily upon the Face of Christ through the praying of the Rosary. In a particular way, I urge you to offer your daily Rosary for the intention of peace in the world, especially in the Holy Land and Iraq, and for the unity and harmony of all Christian families. Think of what powerful grace would come to the whole Church, if the families who make up the Church would pray the Rosary together daily. Each of us is called to recognize Christ alive for us in the Church and to contemplate His face. In his Apostolic Letter “On the Most Holy Rosary,” our Holy Father reminds us: “To look upon the face of Christ, to recognize its mystery amid the daily events and the sufferings of his human life, and then grasp the divine splendor definitively revealed in the Risen Lord, seated in glory at the right hand of the Father: this is the task of every follower of Christ and therefore the task of each one of us” (Rosarium Virginis Mariae, No. 9). Our contemplation of Christ leads us to accept more fully the mystery of our share in the life of the Holy Trinity, experiencing the love of God the Father and enjoying the gifts of the Holy Spirit dwelling within us. There can be no more central or greater desire in our life than the contemplation of Christ through prayer, devotion and the Sacred Liturgy. We recognize Mary as our model in looking upon the Face of Christ, for she conceived Christ in her womb through the overshadowing of the Holy Spirit. From the moment of His conception, before she could see Him, Mary began to devote her attention exclusively to Christ. The Holy Father observes: “No one has ever devoted himself to the contemplation of the face of Christ as faithfully as Mary.” (Ibid., No. 10) From the moment that her eyes looked upon Christ for the first time at His Birth, she never ceased to look upon Him. She was indeed His first and best disciple. As the Holy Father points out, Mary prayed a kind of Rosary from the time of the Annunciation. She was constantly reflecting upon the mystery of the Redemptive Incarnation in the events of the life of her Son, God’s Son, the Redeemer. The Rosary is our way of staying at Mary’s side and gazing upon the various moments of the unfolding of the mystery of God’s love for us in Jesus Christ. In praying the Rosary, we remember, with Mary, the mysteries of our salvation in the Biblical sense. In other words, the mysteries remembered are not only events of the past but are made present today because Christ rose from the dead and is seated in glory at the right hand of the Father. What Christ did by His Coming, His Public Ministry, and His Suffering, Dying and Rising from the Dead, He continues to do in the Church, above all through the Sacred Liturgy. Here, we are reminded of an important point which was made earlier. The Rosary sustains our participation in the Sacred Liturgy and helps us to realize the fruits of that participation in the holiness of daily living. Through the praying of the Rosary, we come to know Christ through Mary. Our Holy Father reminds us that the Holy Spirit, dwelling within us, leads us to all truth, namely to Christ, the fullness of truth. Yet, among creatures, Mary, above all, can teach us to know Christ more profoundly, for no creature knows Christ better than Mary. In praying the Rosary, we imitate the wine stewards at the Wedding Feast of Cana who were sent to Christ by Mary who instructed them to do whatever He would tell them. They were blessed to be the beneficiaries of the first miracle of His public ministry. At Cana, our Blessed Mother showed herself to be the best of teachers, to be the one who helps us to look upon the Face of Christ, in order to understand Him, His teaching and His saving work. With Mary, we ask God about the mysteries which we contemplate, and we ponder them in our hearts through the repetition of the Hail Mary. Our Holy Father reminds us that Mary is not only an example of learning Christ but she obtains for us the gifts of the Holy Spirit, which make it possible for us to come to a deeper and fuller knowledge of Christ. The praying of the Rosary becomes the way for us to grow closer in friendship with Christ and to become more and more like Him. Growing in the likeness of Christ is clearly a struggle for us, for we battle the effects of original sin in our lives. We look to the maternal care of Mary, we go to her side, in order that she may help us to mold our lives according to the mind and heart of Christ. This is what we mean when we call our Blessed Mother mediatrix of grace. Through the praying of the Rosary, the mystery of Christ is presented to us anew and addresses new aspects of our Christian life. The Rosary provides for us, therefore, “a significant catechetical opportunity.” (Ibid., No. 17) The ever virgin Mary continues to proclaim Christ through the Rosary and we grow in our knowledge of Christ by praying the Rosary. Our Holy Father recalls for us how, in the history of the Church, the Rosary was an effective tool in fortifying the faithful against false teaching. Our Lord Jesus is the fullness of the revelation of God to us. But, in order to receive the revelation of God to us in Christ, we must contemplate His Face. We must be silent and pray. The Rosary is a most traditional prayer for the contemplation of the Face of Christ, in order that we may know God. The repetition of the Hail Mary is a kind of canvas upon which the scenes of the life of Christ come before us for our contemplation. Each Hail Mary recalls Christ Who is viewed in the light of each mystery. Until the Apostolic Letter of Pope John Paul II, On the Most Holy Rosary, Christ has been contemplated, through the Rosary, in fifteen mysteries of His vocation and mission for our salvation. The fifteen mysteries with ten Hail Marys for each comes to 150 prayers, the equivalent of the number of the psalms in the Book of Psalms. Our Holy Father has desired to help us to contemplate more fully the mystery of God, revealed in Jesus Christ, by adding an additional five mysteries to the Rosary, mysteries of Christ’s public ministry from His Baptism to the Last Supper. Pope John Paul II calls them the mysteries of light or luminous mysteries, for God is revealed to us through the words and deeds of Christ during His public ministry. By the addition of the five mysteries of light, the Rosary becomes a more complete reflection of the Gospel, a fuller and richer contemplation of the Face of Christ the Savior. The first five decades of the Rosary are the Joyful Mysteries which invite us to reflect more deeply on the mystery of the Incarnation, the mystery of God’s immeasurable love for us by which He has indeed become man in order to suffer and die for our salvation. The first mystery, the Annunciation, recalls the waiting of the People of God over many centuries for the coming of the Redeemer. When Mary replied “Yes” to the will of God that she become the Mother of the Redeemer, she spoke for all men and women of every time and every place, welcoming the long-awaited Redeemer. The Visitation and the Nativity express the profound joy and gladness at God’s coming in our human flesh. The beautiful exclamation of Elizabeth and the leaping of John the Baptist in her womb reflect the mystery: “Blest is she who trusted that the Lord’s words to her would be fulfilled.” (Lk 1:15) In the scene of the Birth of our Lord, every detail underlines the wonder of the event heralded by angels to shepherds keeping watch by night. The Holy Father tells us: “To meditate upon the ‘joyful’ mysteries, then, is to enter into the ultimate causes and the deepest meaning of Christian joy” (No. 20). In the Joyful Mysteries, we look upon the Face of Christ, God become man for our redemption. At His Baptism, God the Father declares the vocation and mission of His beloved Son, while the Holy Spirit descends upon Him in all His fullness for the carrying out of His mission. At the Wedding Feast of Cana, Christ performed the first of His saving signs, through the intercession of His Mother, revealing the tender mercy of God toward us. By the proclamation of the Kingdom of God, Christ calls all men and women to conversion and offers forgiveness to the contrite of heart. This mystery leads us to reflect in a special way upon the Sacrament of Penance by which Christ continuously calls us to conversion of life and grants the forgiveness of our sins. The fourth mystery presents for our contemplation the glorious Christ on Mount Tabor, preparing us for His Passion and Death, so that we may share in His Resurrection, the outpouring of the Holy Spirit into our lives. The fifth mystery of light or luminous mystery is the Lord’s Supper by which Christ renews for all time the outpouring of His life for us on Calvary. Our Holy Father notes that our Blessed Mother “remains in the background” in these mysteries. Yet, even as witnessed at the Wedding of Cana, Mary was the first and best of the disciples of her divine Son. As the Holy Father indicates, her words at Cana, “Do whatever he tells you” (Jn 2:5), reflect her discipleship, her accompanying us in the contemplation of Christ through the mysteries of light. The Incarnation comes to its fullness in the events by which our Lord suffered and died for our salvation. Through the Sorrowful Mysteries, we are invited to contemplate the face of Christ Who brings to completion His saving work. Each mystery, beginning with the Agony in the Garden, uncovers for us the great price which Christ paid for our salvation: the Scourging at the Pillar, the Crowning with Thorns, the Carrying of the Cross and the Crucifixion. The Sorrowful Mysteries make dramatically clear the immensity of God’s love for us. At the same time, they reveal to us the mystery of our own life, the finding of our life by dying to self. In the Sorrowful Mysteries, we stand with Mary at the foot of the cross and receive, with her, into our arms the lifeless body of her Son Who has given up His life for us. Through the contemplation of the Face of the sorrowful Christ, we find, with Mary, the life of God, offered for our eternal salvation. In the fourth mystery, the Assumption, we contemplate our destiny which is sharing in the glory of Christ at the resurrection of the dead, which final destiny Mary was privileged to enjoy beforehand. In the fifth mystery, the Crowning of Mary as Queen of Heaven and Earth, we contemplate the Face of the glorious Christ in the fullness of life to which the whole Church is called in Him. Finally, our Holy Father recalls to our minds once again the words he spoke during the Angelus Message after the inauguration of His ministry as Successor of Saint Peter. The praying of the Rosary “marks the rhythm of human life.” (No. 25) Contemplating the Face of Christ in the mysteries of the Holy Rosary, we contemplate the face of man and woman, called to life in Christ. We bring to our praying of the Rosary everything which makes up our life, all of which Christ desires to take up with us, to unite to the mystery of His suffering, dying and rising from the dead. Through the praying of the Rosary, we contemplate the Face of Christ and, thereby, discover the deepest truth about ourselves. I bring to conclusion my meditations on the Holy Father’s Apostolic Letter On the Most Holy Rosary by reflecting upon the Rosary as a method of prayer and discussing the various parts of the Rosary. The method of prayer of the Rosary is the repetition of words which express our deep love of God. It is not a tedious exercise but rather the repeated expression of deep love. We never tire of the words, and we never tire of repeating them, because through them we draw ever closer to God Whom we love with all our heart. The goal of the method is our ever deeper appreciation of and union with the mystery, the mysteries, of God’s love for us, upon which we meditate. The very form of the prayer underlines the mystery of the Incarnation. God has taken a human heart, now the glorious Heart of Jesus seated at the right hand of the Father, which receives with great affection our repeated expressions of love. The Holy Father recalls to our mind how Christ asked Peter three times: “Do you love me?” Christ’s repeated question and Saint Peter’s repeated response help us to understand the beauty of praying the Rosary as a repeated response of our love for God. The repetition is centered principally upon the Hail Mary, addressed to Mary. But the prayer is directed, with Mary and through her intercession, to her divine Son, our Lord Jesus. It expresses our desire to be ever more fully united to Christ, to become ever more Christlike. Ultimately, the Rosary is a most wonderful expression of the daily conversion of life by which we grow in holiness. The method of the Rosary, effective as it has been over the centuries and continues to be, certainly can be improved. For instance, the Holy Father has added five new mysteries to make fuller our meditation upon the mystery of Christ’s life in us. The Holy Father also makes a number of other suggestions in order to help us to pray the Rosary more effectively. The Holy Father urges the return to the practice of praying the Rosary in the family. He rightly points out: “Individual family members, in turning their eyes towards Jesus, also regain the ability to look one another in the eye, to communicate, to show solidarity, to forgive one another and to see their covenant of love renewed in the Spirit of God.” (No. 41) The heart of the family life apostolate in the Diocese ought to be prayer in the family, especially the praying of the Rosary. It is especially important that we hand on to our children this powerful prayer, so that it will be theirs when they need it most. 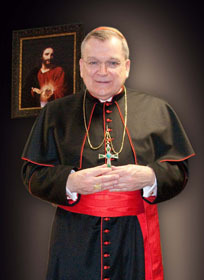 Copyright © 2003 Raymond Leo Cardinal Burke. Used with permission.